I finally got news about Cas and it isn't good. There isn't anything can be done so now the only thing left is to see if she's in pain or not. If she isn't in pain, then the advice we've gotten is to leave her for now and watch her carefully. If she is in pain, well, I'm not going to let her keep on living in pain. I'm going to go see her next weekend and we'll decide then I guess. I don't really know what to say. I've known almost her whole life that we would have to put her down early and I've always tried to prepare myself for this, but I guess I didn't do a very good job. I never got to hang out with her or work with her like I do with Artemis, but she's still Socks first baby and she's still one of the greatest horses I know. Maybe not the nicest but I love her for her big and extreme personality. I've been trying really hard not to think about this lately because it's just, too painful to and I honestly don't know how I feel about it. I hate knowing that she'll never get to live her full life and I'll never know what she'll be like once she's older, but I just can't let her live in pain. I don't know how much you guys know about her injury because I don't like to talk about it and the vets who have seen her don't agree on the same cause. Basically though, she likely broke her fetlock when she was young, but in a way that she was still able to move on it. We had no idea, it didn't look strange or anything, and since I don't get to spend a lot of time up there, if she was limping, I had no idea. 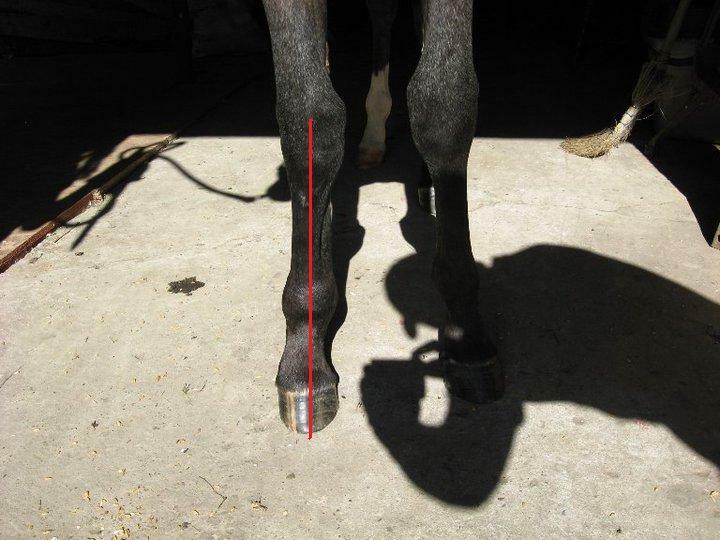 Her fetlock than healed wrong and it began to fuse together. This is where it gets a little bit confusing, and I'm sorry but please bare with me. It's been over a year since the vet told me and I was pretty upset when he did. 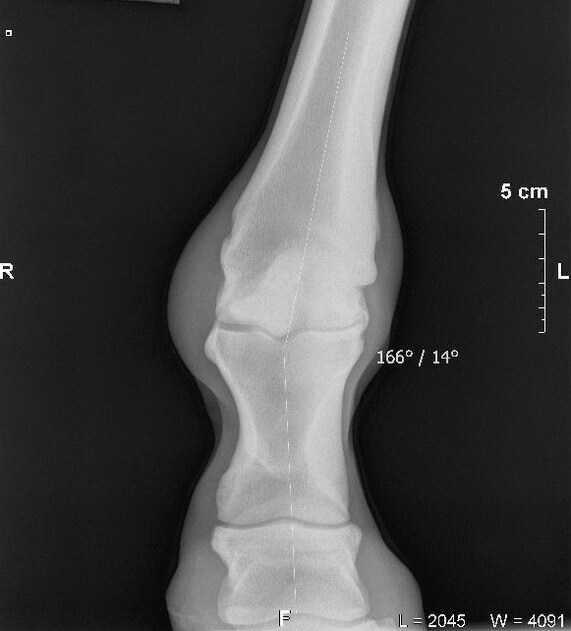 Basically because of the injury, on one side of her leg, the bone began to grow faster than on the other side, which is what has caused the angle in her leg. Here was her foot in the summer of 2010. You can already see that her leg is a little weird (right front). Here is an X-ray of her leg that was taken in October 2010. Her leg is at a 14 degree angle, which is not good, at all. The vet was surprised by the angle of her leg. This was from either Febuary or March 2011, I forget which one. I apologize because it isn't quite straight on so you can't get a good idea, but even so you can see a difference from the picture taken in the summer of 2010. And her leg is worse now, but I couldn't bring myself to take a picture of it lately. She is owned by both my brother and I, and long ago we decided that as long as she was painfree and happy, she could live out in the pasture and be like any other horse. But once she was in pain, we weren't going to let her suffer. My brother saw her last weekend and now it's my turn. He's waiting for what I think about it and honestly, I just hope I'm strong enough to make the right decision. I love her and I really don't want to let her go, but I promised her I wouldn't let her be in pain. Right now that is the biggest question. I get told all the time that she is doing horrible, but it doesn't add up to what my siblings and I see, and what I am told by other people. Unfortuantly my main source of information comes from somebody who doesn't believe you should keep a horse that is not rideable, so the information I recieve from them is not entirely accurate and never has been. Hopefully next weekend I will see for myself. Oh no! I'm so sorry C-jay, I hope she is not in pain, but if she is, you are doing the right thing. A lot of people seem to have the idea that you shouldn't keep horses that aren't able to work, but I think that is a load of crap. A few people have told me to take Lady to the knackers and it takes all my strenght to keep from yelling at them, but they always get told exactly what I think of that. I don't see what's so bad about keeping a pasture pet, in fact, I think it's one of the kindest things you can do. I hope Cas looks well on the weekend. I know this must be tough for you and your brother and I hope everything works out for you. I hope she's okay, really I do. But I know that regardless what happens, you ARE strong enough to do the right thing. I know you and I know that you will get through this and I will be here for you too. I think you are right to prepare yourself for the worst, but I don't think you should ever stop hoping either. That is really tough. My mom has a horse with a problem a little bit like that. Basically, she was laying funny in the uterus and when she was born, one of her fetlocks was really messed up. We caught it early and had the vet try to correct it, but it didn't work so now it gets a bit worse every year. She is pretty lame on it, but she still seems really happy. 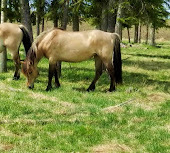 She is the boss mare in her little herd of three, and still trots up to get grain and chases the others away. However, since it keeps getting worse, we may have to put her down eventually, but now she is 7 or 8 I think and still seems happy. So if you and your brother think Cas looks happy, then maybe she can be a pasture pet. I know some people, like you said, are against keeping unrideable horses, but if she seems happy, then I think it would be ok.
Let us know how she looks when you see her next! I hope she is pain-free.